South Africa's Olympic governing body, Sascoc, suspended ASA last week for its role in the gender-testing debacle involving 800m world champion runner Caster Semenya. After ASA refused to acknowledge its suspension, Sascoc expelled it. Sascoc-appointed administrator Ray Mali was due to occupy his office in Houghton, Johannesburg, yesterday. He has been told to take over the running of ASA and appoint an interim board. interdict by ASA, which claims that Sascoc had no right to take the action it has. ASA officers refuse to appear before a disciplinary hearing. Tubby Reddy, Sascoc's chief executive officer, said that a decision was taken to expel ASA from Sascoc - meaning it is now an independent body with no powers. "We have informed the IAAF and Athletics Africa that ASA is no longer actively our member until such time as they listen to our demands," said Reddy. Reddy said the suspension of the ASA membership meant that "everyone in ASA" - the board, the ASA regional offices and even athletes - will not be able to participate in any international events. "It is now up to ASA to decide what is good for them. 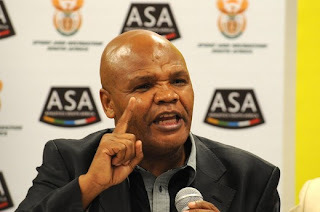 Until they listen to our demands and all suspended officials appear before the disciplinary inquiry and allow us to bring someone to handle the ASA, then their membership remains suspended," he said. "We got the letter from the attorneys acting on behalf of Chuene, the ASA board and ASA saying we don't have the right to suspend the board. They asked us to withdraw the suspension .. they also said that if we send Mali or anyone interfering with the running of the ASA they will interdict us." Gideon Sam, Sascoc's president, said Sascoc was "within our rights to suspend the ASA board".